Most of us are prone to thinking the grass is always greener in someone else’s life. That if we could just swap our meager lives for that other person’s richer existence, we’d be happier. Julia Mayer sets that desire in the angst-ridden teenage years to craft a curious, if ultimately unconvincing, fantasy novel of friendship, betrayal, and renewal. Samara is not a happy girl. She’s never gotten over the death of her mother when she was little. Now that she’s in high school, her father wants to date again, so she hates him for forgetting her mother—and hates herself for being unable to let go. Her only respite comes from cutting—using razor blades to create scars where no one can see—to echo the painful scars inside her own mind. Then Samara discovers Dee, a girl her age who looks enough like her to be her twin. In fact, Dee is a kind of twin, her reflection from a parallel universe where Dee is happy, well-adjusted, a good student with friends and a loving mom instead of a distracted dad. Samara convinces Dee to switch places with her, just for a day or so. But in that time, they manage to turn each other’s lives inside out. Samara is enraged when she learns that Dee has rekindled old friendships Samara abandoned—not to mention telling Samara’s dad about her cutting. For payback, she sleeps with Dee’s brand new boyfriend Jamie. 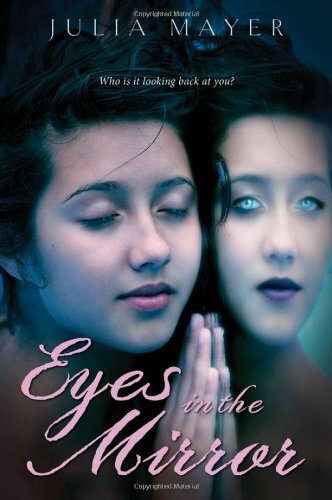 Fortunately for Samara, the worst that can happen from Dee’s doings is a week in a rehab clinic, and weekly counseling sessions, where she meets new friend Tanya and finds her life improving—in spite of herself. Meanwhile, Dee is left with a heart-wrenching choice and a much narrower life than the one she’d hoped for. Yet somehow, unbelievably, they part friends. While the story begins with promise, Eyes in the Mirror fails to live up to expectations. Endnotes point out the fact that Ms. Mayer wrote the novel as a teenager, in a summer writing workshop in 2003, which explains the book’s teen TV show feel. Although it’s surely been rewritten since those tender days, it still retains the feel of a journeyman work. Chapters alternate Dee’s and Samara’s points of view in overlapping and ultimately repetitive fashion. While Dee and Samara are fairly developed at the start, by the end Dee has become as thin and unbelievable as the peripheral characters. This is the kind of novel that makes the reader itch to rewrite it: to take the perfectly serviceable opening and open up the story into something larger and richer, more complicated, more believable—and thus ultimately more meaningful.